Old Time Radio Page. Click on pictures to get larger/higher quality images. Decades ago, while I was still in grade school, I borrowed a book from the school library and practically wore it to tatters reading it over and over again-- "The Boy's First Book of Radio and Electronics," by Alfred Morgan. For some reason, I never actually built a single one of the many radio and amplifier projects that Morgan had presented in his book. I must have been more of a dreamer than a doer, way back then. Well, in June of 2003, I ran across a copy of the book in a used book store and bought it. The ensuing wave of nostalgia proved overwhelming, and before I knew it, I had ordered parts! 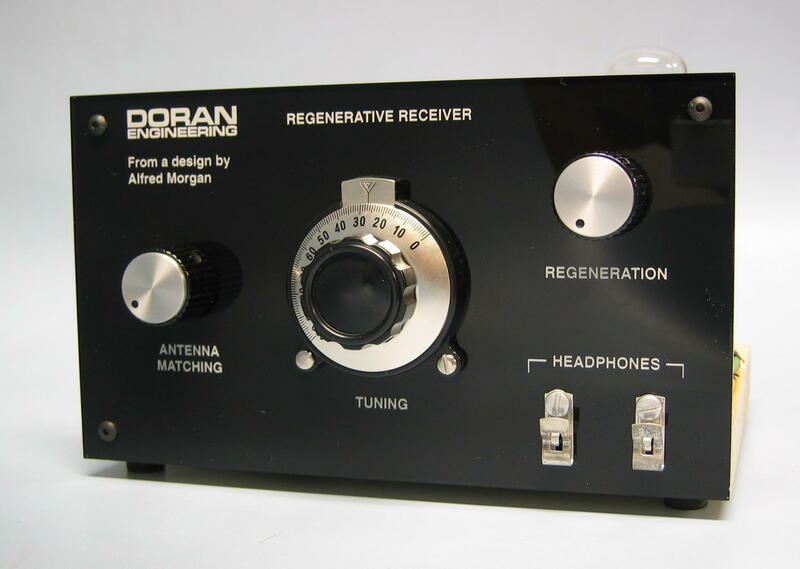 « Here is a rear view of the one-tube Regenerative Receiver I built from the design shown in Morgan's book. 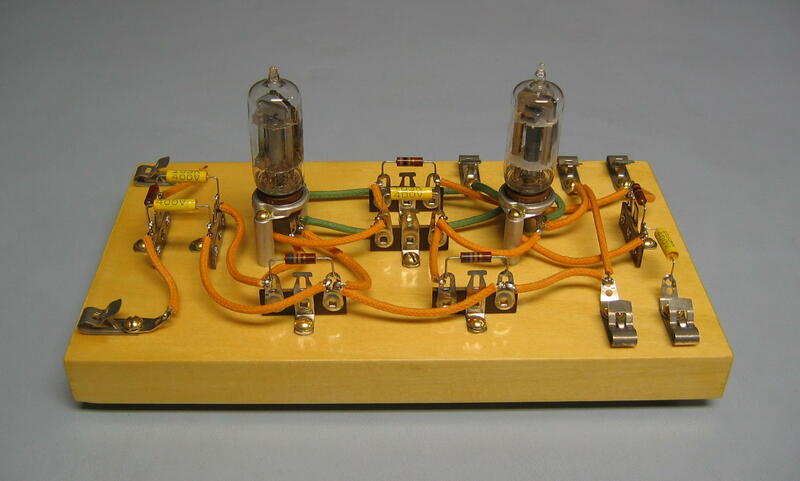 This is an example of "breadboard" construction; mounting all of the parts on a piece of wood rather than on an aluminum or steel chassis--a popular, inexpensive technique widely used in the early days of radio and electronics. 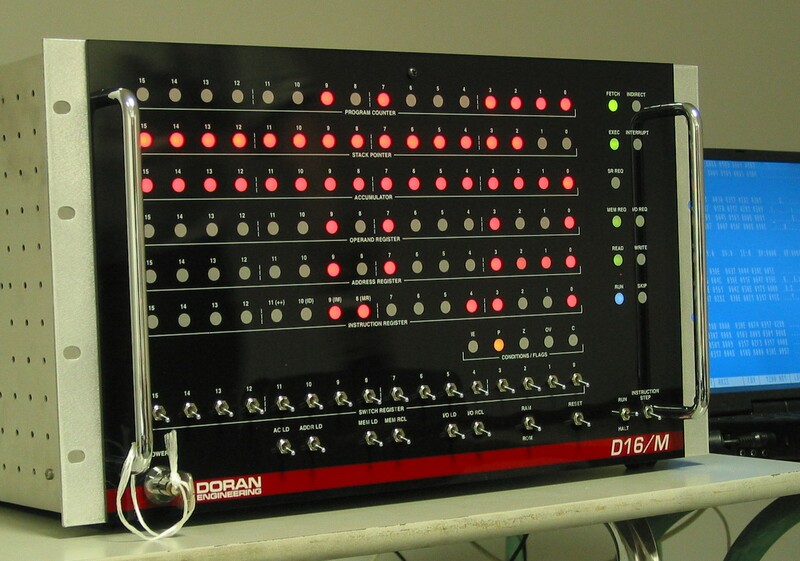 « Here is the receiver's front panel. I laser-engraved a piece of black-painted clear acrylic to make it, using the same technique described in the Design and Construction Notes for the D16/M minicomputer. 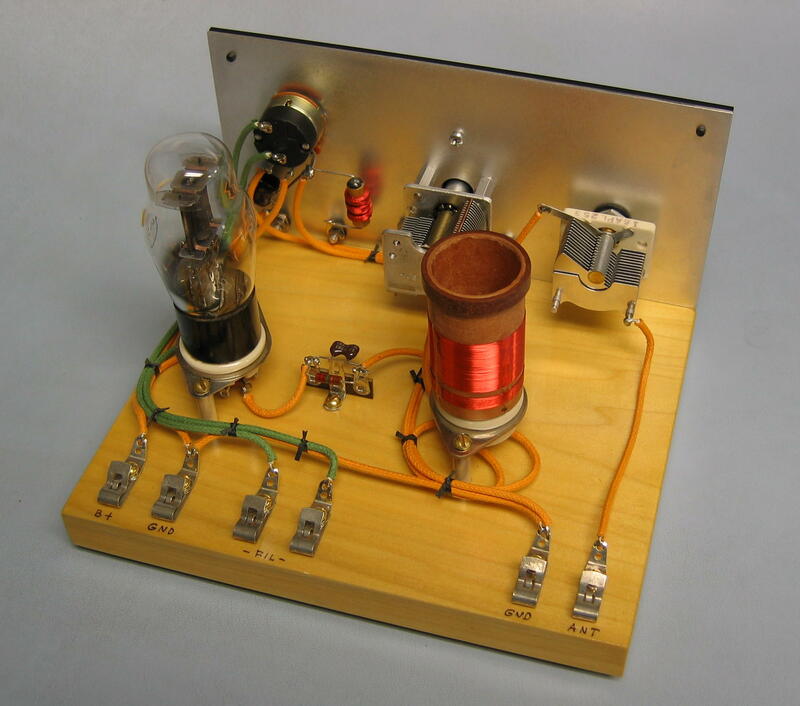 « This is Morgan's transformer-coupled, one-tube audio amplifier, intended for use with the receiver. 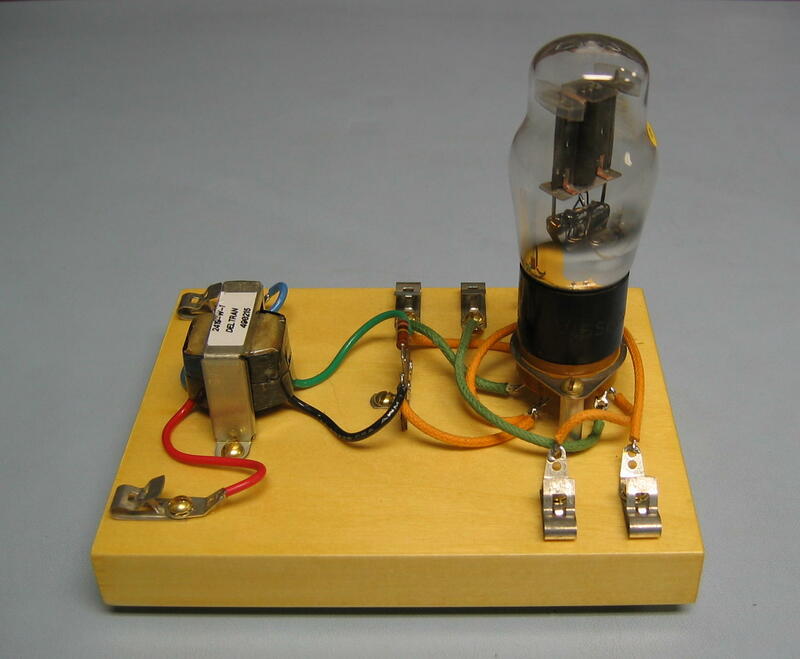 As in the receiver itself, I substituted an older "Coke-bottle" envelope triode (a 6C5 G) for the miniature type 6BF6 that Morgan had specified in the book. « Morgan also presented this little two-tube amplifier! I kept the 6BF6 tubes for this one. This amp, as shown in the book, had a fatal flaw even in the13th printing (easily fixed, though; see my Radio Notes)--making me wonder just how many kids actually built it. 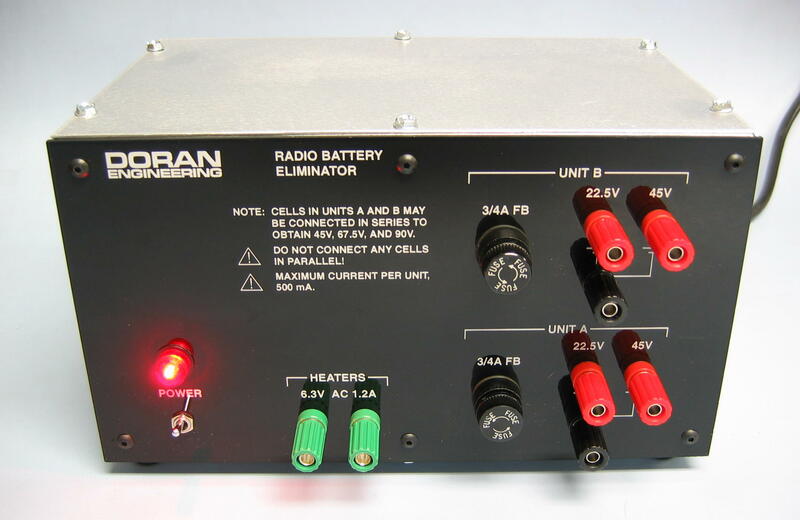 « Projects like Morgan's were intended to be run on radio "B" batteries; 22.5V, 45V, 67.5V, and 90V units were typical. You can still buy these batteries, but they are really expensive and last only a short while. Why not build my line-operated "battery eliminator" power supply instead? « Here is a look inside the battery eliminator. 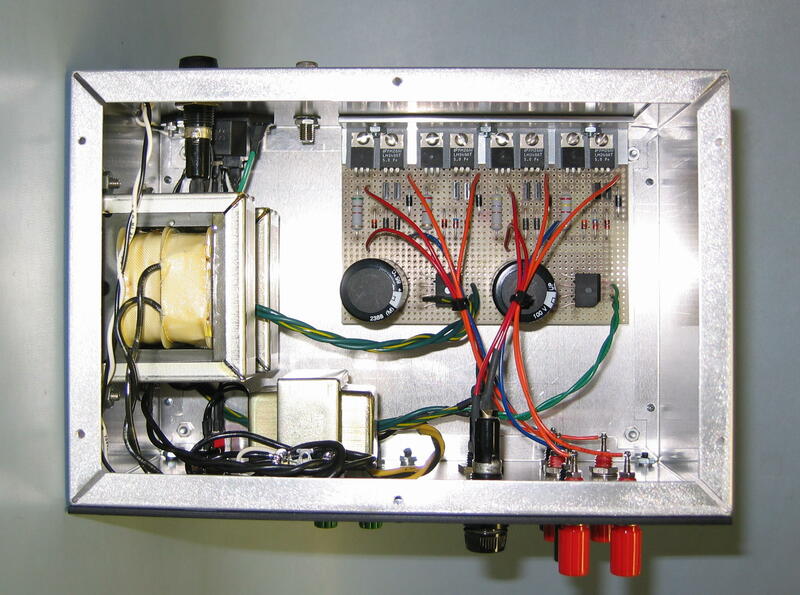 It contains two independent transformer-isolated dual-output regulated DC power supplies in one cabinet, arranged so that they may be connected in series to get the range of simulated battery voltages. 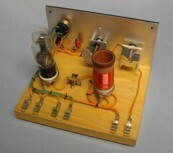 A separate filament transformer provides 6.3V AC for the tube heaters. Documentation follows; Adobe PDF unless otherwise stated. ELIMINATOR_SCH Schematic diagram of the battery eliminator power supply. radio_notes (HTML) Construction Notes for the radio gear and battery eliminator.